Industrial bathrooms aren't all cold and clinical. Materials like concrete, metal, and wood can have a warm, welcoming effect, especially when used with a good design sense. This industrial bathroom from Melissa Winn Interiors is a great example of a welcoming bathroom using typically industrial materials like stone and concrete. Industrial doesn't mean dark and broody; take this white, uncluttered, minimalist bathroom for example. It uses the bright light from the ceiling windows to reflect on the copper accessories. Note the simplicity of a sink set on a metal table, and the single lightbulb hanging from a wire. A simple project from lilikoijoy.com for building making industrial pipe hooks will work amazingly well in your industrial-style bathroom. These pipe hangers can be the finishing touch to a retro/vintage chic bathroom. Imagine hanging your towels and bathrobe off these great hooks! Industrial doesn't always (or ever) mean dull, grey and colorless. This industrial bathroom has a splash of brightening yellow to bring joy and light to the space. Other industrial features include the naked bulbs, exposed wiring, and hardwood floors. This unique design, found on Decoholic.org, is perfect for someone who enjoys open-concept, walk-in showers. The glass walls protect the surrounding wood floor from splashing and damage, but also give the bathroom a unique look—mostly because of the exposed pipes. 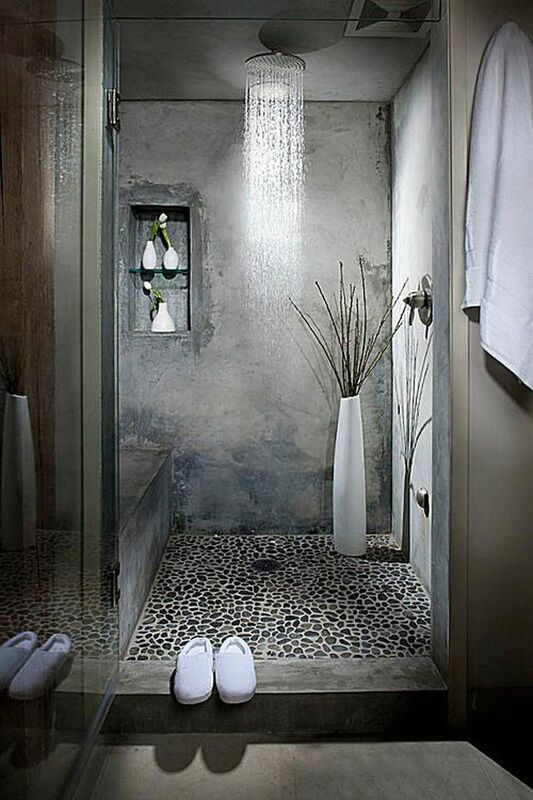 Instead of coming through the wall, the designer here chose to bring the water from the floor and install a shower that gets its inspiration from ​the communal beach or poolside showers, but with all the privacy of a private bathroom. The overall minimalism is stunning as well: no shelves to put products, so they go on the floor or on the counter, near the sink. Towels are still easily accessible via the entrance of the shower, and they dry on the industrial-looking rack on the side of the room. You could hardly find anything more industrial than this commercial bathroom located at Donny's Bar, in Sydney. It has everything industrial: from exposed pipes and naked lightbulbs to tin ceilings, a retro tank style toilet, and a large porcelain sink. It's dark and broody. It has metal, subway tile, and a floor drain. This is an industrial lover's dream bathroom! This industrial bathroom features a sliding door with exposed metal guides, an original, exposed brick wall, and a concrete floor. The rough, unfinished look is perfect for the industrial aesthetic. It's possible to protect brick walls from the humidity of bathrooms with the right finish; but in the case of a powder room, humidity is less of an issue. Studio MMA designed this particular bathroom, with great industrial success. Concrete isn't just for big buildings or utilitarian purposes: it's become a favorite material for industrial-style homes. And bathrooms are using it a lot: a concrete bath, for example, is a stunning feature for an otherwise minimalist space. Concrete has an interesting texture that does well in clever lighting. Playing with light and shadow, you can create a variety of effects. In this case, natural lighting from a nearby window brings out the variance in greys within the concrete itself. Well, here you have it: stick a piece of marble on top of a machine, and you have the perfect vintage/industrial vanity for your bathroom. This exquisitely original piece features a rusty frame filled with old machinery cogs. How industrial is that? The rest of the space remains minimalist and white, so the vanity remains the focus of the room. Here's another interpretation of the bright and sunny industrial bathroom: plenty of white tiles reflects the natural light from the large high window, while copper pipes and vintage-style hardware give the space its industrial roughness. The shower has space for two people (neat) and the wood vanity adds a needed touch of warmth.